Legrand 4-Gang Standard size screwless wallplate in white color, features plastic construction and gloss finish. The rectangle wallplate has dimensions of 8.88-Inch x 0.35-Inch x 5.13-Inch. It has four dimmer/outlet/switch configuration. Wallplate offers horizontal orientation and snap-in mounting. 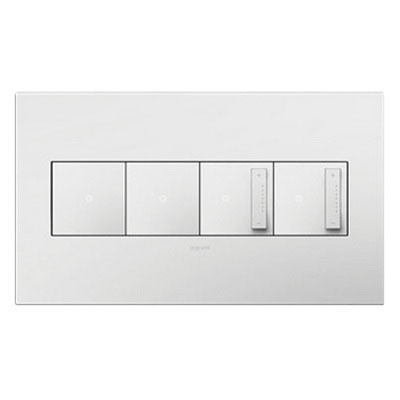 It is great choice for upgrading the look of a standard wall switch, dimmer switch or outlet while adding space for more devices. Innovative screw-less design of this wallplate assures easy installation by simply snapping into existing metal frame. Wallplate is UL/ETL/cULus/cETLus listed.